The Track Team competed in Columbia on Saturday at one of the largest track meets in the southeast! 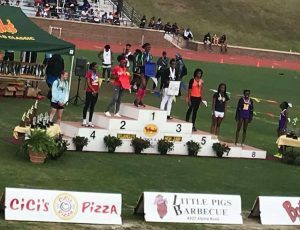 Congratulations to Tia Lucas, who placed 5th in the High Jump and Major Chestnut, who placed 7th in the Discus. Special congratulations to Hannah Vroon! 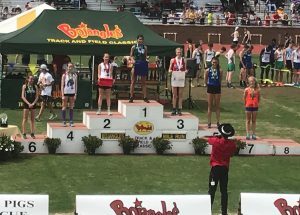 She placed 7th in the Mile and shattered the school record with a time of 5-minutes and 8-seconds!! And special congratulations to Carson Tillman! 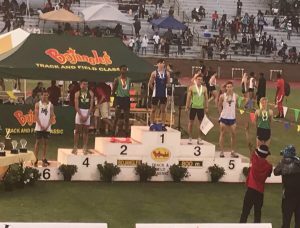 Carson placed 5th in the 800m Run, also breaking the school record with a time of 1-minute and 55.5 seconds! Carson Tillman just took 5th in the 800m Run! ….and broke the school record! Hannah Vroon took 7th in the Mile Run! … and set a new school record! Tia Lucas took 5th in the High Jump! 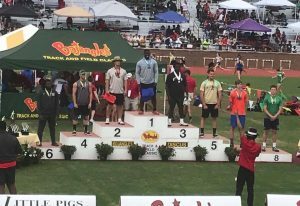 Major Chestnut took 7th in the Discus!